This tutorial is going to show beginners how to easily setup a VNC server in Ubuntu 16.04 so to connect from remote machines. 1.) 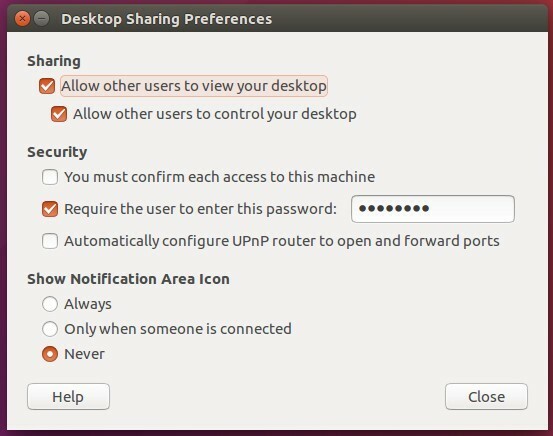 Ubuntu desktop provides vino VNC server out-of-the-box with a simple UI called Desktop Sharing. 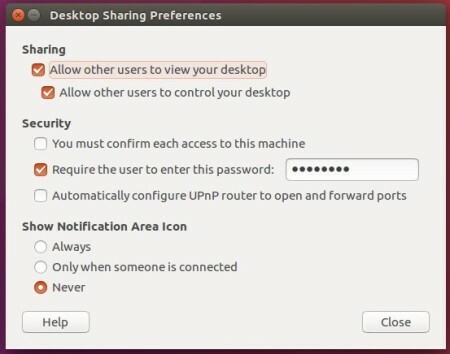 If you want to be able to choose whether to allow someone to access your desktop, enable the first box. To require other people to type a password when connecting to your desktop, enable the second one and set a password. After setting up the VNC server, just close the utility. A workaround is to disable encryption requirement. To do so, install dconf Editor from Ubuntu Software (or via sudo apt install dconf-editor command in terminal), and launch it. When it opens, navigate to org -> gnome -> desktop -> remote-access, and uncheck the value of “require-encryption” in right. Finally connect to this desktop on remote machine by typing the IP and password using a VNC client! So, after enabling, a “helper” can just use a VNC viewer to access remote Ubuntu with listener IP ? However, I keep getting “authentication failure” on TightVNC on Windows 7 after I enter the remote password. Thank you! Worked prefect on the first try! My other attempts at vnc screwed up my Ubuntu 16.04 so much I had to re-install it. Which VNC viewer on your Windows machine did you use? Did you need to install a vnc server on the Ubuntu 16.04 machine (or is it already running by default on 16.04)? Hi, I followed all the steps but after installed the dconf Editor, I neither could uncheck the “require ecryption” item just because the dialogue box that appeared was empty for the “name” and “value” columns. I want to acces to my Ubuntu 16.04 desktop form my home PC with windows 10 home and a ubuntu virtual box. What can I do for to work as well? and for those of you that couldn’t get it by this way. This works great – although if the server reboots, it appears I have to login to to the console before it is available. Any way to have this available automatically after a reboot? Thank you! After disable the “require-encryption”, I can connect from windows to ubuntu by VNC, but get a empty desktop, cannot do anything on it. What’s the problem and how to solve it? Dou you have any idea what could be the problem?